Yesterday marked six weeks since my departure from the US, if anyone’s keeping track. There are a lot of things in life I just never really pictured myself doing. Operating a wheelchair-lift bus for two years was one of them. I’m a words-and-pictures person, you know, a books-and-paper kind of girl. Being on the road 8 hours a day and barking, “Ten-four,” and “What’s your twenty?” into a two-way radio wasn’t really on the bucket list. I learned a lot, though, it paid the bills, and it got me to the next thing. Which is here. Then there’s teaching. I never thought of myself as qualified for the responsibility, and I only really decided to give it a try when I saw my twenties slipping un-adventurously away and realized that less qualified people than me apply for this gig all the time. Now I’m here, and some days I struggle with the work, but if there’s going to be a foreign teacher struggling at this school it might as well be me. I’m doing my best, and I’m learning. Another thing I never saw myself doing is owning a motorbike. It’s a 1998 Honda Dream Exces. Semi-automatic; four gears and no clutch. I’m still not entirely clear on the distinctions between scooter, motorbike, and motorcycle according to US standards, but I’ve gathered that this sort of thing depends on the number of CCs in the engine. I’m also having trouble finding the exact specifications for my vehicle on the internet, but my current understanding is that is below the 150 cc threshold for full-on motorcycle status. It gets up to 55 mph easily, though, topping out around 60, and I would definitely need a motorcycle license to operate it back in the states. It wasn’t, and that is just fine. 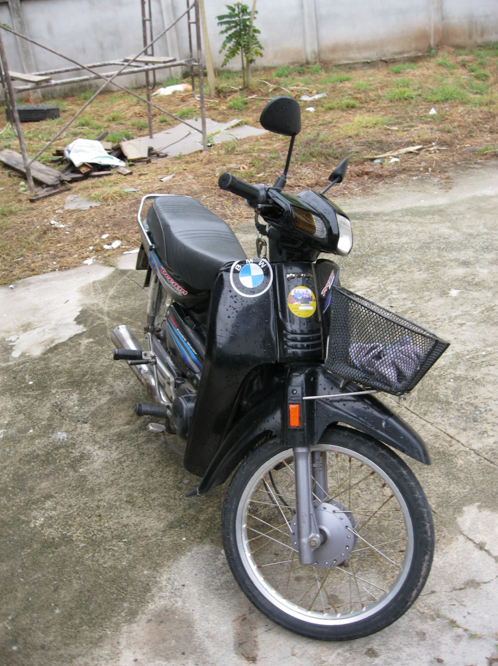 I have grown to really like my motorbike, with its black paint and dented tailpipe. Somewhere along its life someone christened it with a BMW sticker, and it has a basket for groceries. 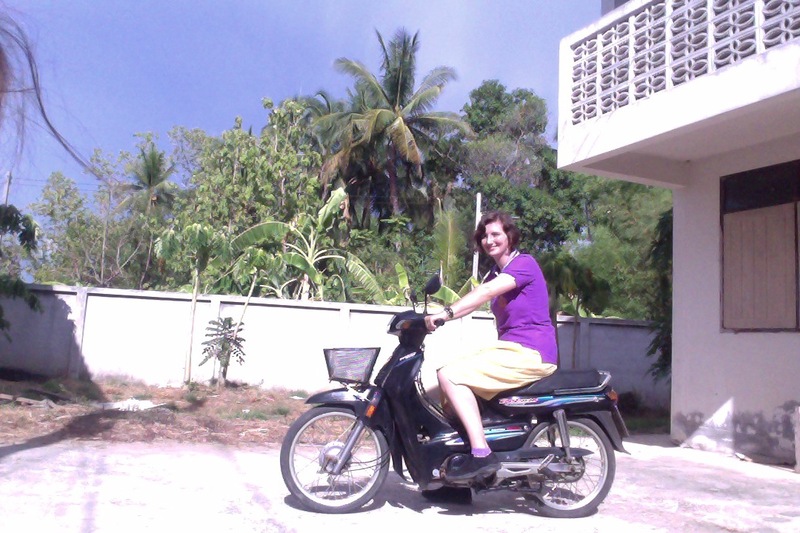 I had originally wanted an automatic scooter, having had 24 hours experience driving one four years ago in Koh Samet, but Brian (the same teacher) told me that was silly. This would be cheaper, and it would be easy. No problem. Brian is a hero, by the way. He got the seller (chicken guy, we call him, because the shop also sells roasted chicken) to drive my bike to the school. He then drove the guy back to his shop, and spent the next hour teaching me how to work my gears and start my bike while I drove endless laps around around a parking lot at the school. By the end of the night, I felt nearly confident. Easy! I am still not always the smoothest gear shifter, especially when I get to thinking of other things, but I can cruise along on the left side of the road with the best of them now. And having wheels makes life possible. Having wheels means freedom. Incidentally, I’ve never owned a car before. This is my first motor vehicle, so I’m a little proud. But I would be completely stuck at the school, miles from anything, without it. It means I can drive into town to go shopping, to get dinner, to find a coffee shop, to sit by the river. 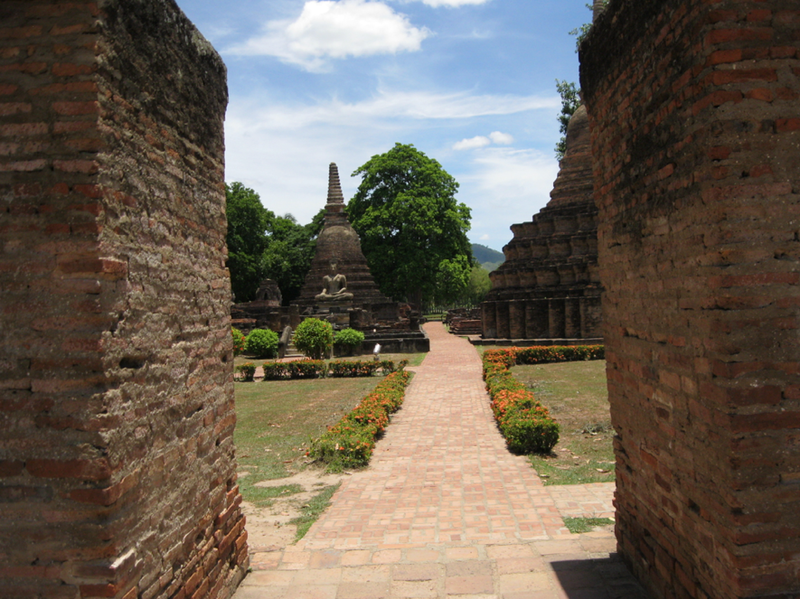 And maybe it’s not really built for long distance, but taking an hour and a half highway drive to Sukothai and biking around the ruins of famous temples was so much more satisfying than an hour bus ride. Life is good. And life is still confusing and full of ups and downs, but hey. Motorbike. Ancient ruins. Can’t complain. I love this blog post. Your adventurous spirit is an inspiration. You don’t just think about doing stuff; you actually do stuff. And speaking of inspiration, are you doing Camp NaNo this year? I remember you did it last year, and I was super impressed. I’ve never done it before, but this year I want to. Last year’s NaNo book needs finishing, and a new goal would be helpful! I did it last year because I wanted to finish my novel from November. I ended up writing just about anything that popped into my head to get my word count. Trying to finish my novel made me feel like Mozart in that scene from Amadeus where his wife asks why he’s not working on the Requiem and he says, “I think it’s killing me.” Unless I experience a change of heart in the next couple if weeks, I’m going to pass on camp this year. I would love to see you finish your novel because I know it’s going to be great and I look forward to reading it. Sounds like you’re settling in well Grace. Love the photos. You look good on your motor bike and the ruins are wonderful! Such an adventuresome spirit!!! Kudos to you!